The spines are more flexible than in other subspecies, flattened, annulate, pungent, either straight or curved at apex, perhaps never hooked, usually yellow but sometimes reddish on young plants but also turning yellow in age. Origin and Habitat: Texas and California, USA. 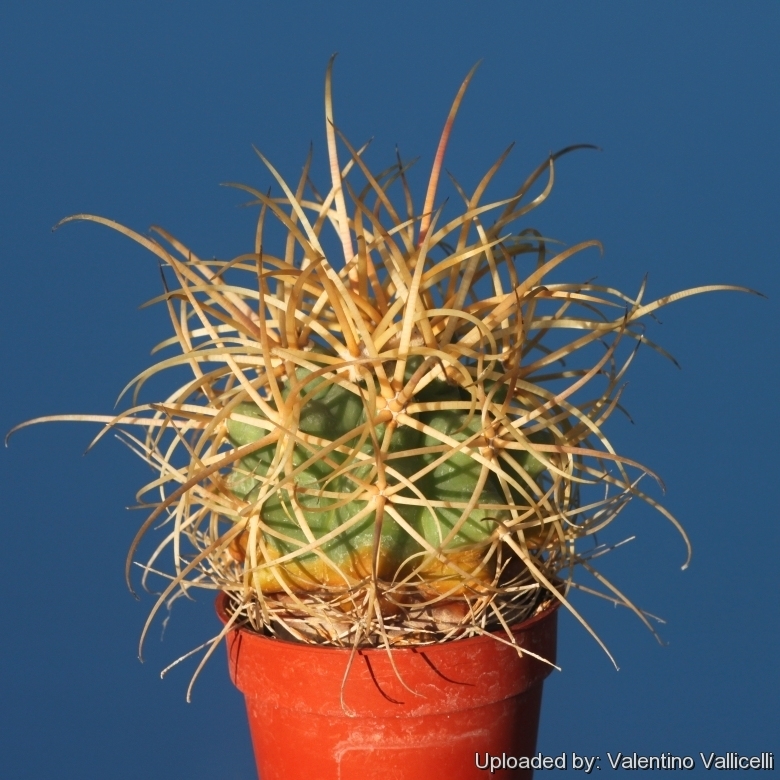 Description: Ferocactus rostii (a.k.a. Golden Spined Barrel Cactus) along with Ferocactus lecontei, and Ferocactus tortulispinus is one of the old controversial geographical forms of the variable Ferocactus cylindraceus = (Ferocactus acanthodes). Ferocactus rostii is closely set with interlocking spine clusters, which almost conceal the body of the plant and whitish to golden in maturity, it is similar to Ferocactus acanthodes, but the stem is thinner, taller and the spines are more curved. However it look very similar to other varieties of Ferocactus cylindraceus which are linked one to each others by populations of plants with intermediate characteristics. Nowadays all them are thought to belong to a unique polymorphic species. Such variations has led to establishment of several unnecessary names for this species. Stem: Green, spherical becoming columnar up to 3 m tall and 30 cm in diameter. Ribs: 16 to 22, rather low (hardly 1 cm high), obtuse, somewhat tubercled. Areoles: Large, white-felted, closely set. Spines: About 12, sometimes fewer, 3 or 4 central forming a crucifix shape, those on the lower part of the plant more or less spreading, those at or near the top erect, somewhat flexible, flattened, annulate, pungent, either straight or curved at apex, perhaps never hooked, usually yellow but sometimes reddish on young plants but also turning yellow in age. Radial bristles: Sometimes wanting but when present 2 to 8, white or yellowish. Flowers: Dark yellow at the crown of the plant, 4 to 6 cm in diameter. Blooming season: Spring ( in habitat May and June). Fruit: Fleshy, covered with scales, red, 5 cm long, 2,5 cm in diameter. Cultivation and Propagation: Ferocactus acanthodes var. rostii are summer-growing and pretty easy plants. Growing rate: Thought slow to start they speed when they reach about five cm in diameter. Plants in good conditions will start to bloom when reach the diameter of only 15-18 cm.